ASK Engineering Solutions Ltd based in Yeovil, Somerset are specialists in electrical and mechanical solutions for a diverse range of industries. These include Food and Beverage, Dairy, Manufacturing, Water & Waste, Steel Production, Print & Paper, Agriculture, Facilities Management, Aerospace and Nuclear. ASK Engineering supply to companies across the UK and Europe via our courier agents in the South and South West (including South Wales). ASK Engineering provide a dedicated customer service experience by finding a solution for almost any product or service you require. We offer a comprehensive range of products including Radical Ball Bearings, Self-Aligning Ball Bearings, High Precisions Bearings, Hollow Pin Chain, Wire Belt Chain, Leaf Chain, Brake Motors, Marine Spec Motors, DC Motors, Dosing Pumps, Piston Pumps, Coolant Pumps, Vacuum Pumps & Blowers and much more. ASK Engineering source and supply products from some of the world’s top leading manufacturers such as Gerdner Denver, Inoxpa, Lenze, TECO, Wilco and many others. Our services include high quality repair and machining service which are carried out to the highest standards by our team of highly experienced engineers. This can be carried out on almost any type of motor, gearbox, pump etc. We have been using ASK Engineering Solutions since they have started recently and have found them very informative and helpful in our enquiries and very quick in response for quotes.We have purchased many motors and gear boxes from ASK and found them to be very competitive in their prices and the delivery times have been very good and will continue to use them as our main supplier in the future. 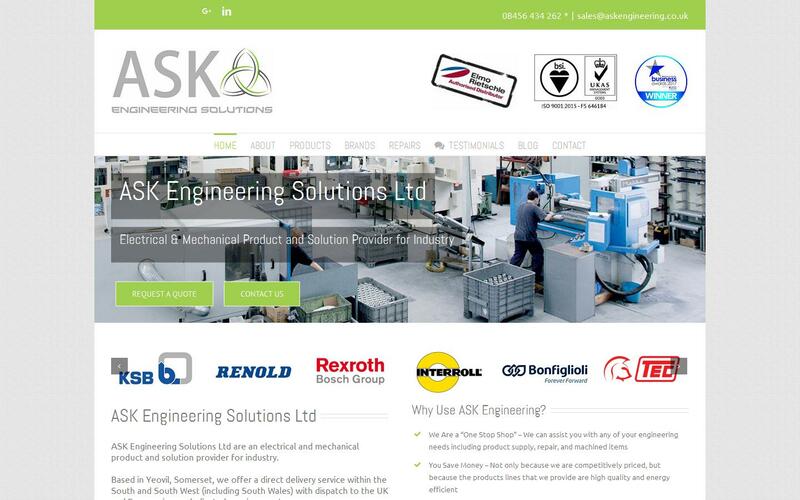 We have used ASK Engineering since they started for bearings, motors and belts. Quotes are turned around extremely quickly especially compared to other suppliers. Lead time and prices are ultra competitive! ASK have always bent over backwards to suit our needs and requirements – whether its technical information or meeting tight deadlines. I can’t recommend them enough, they are a real life line to our company. ASK have now become my one stop shop for all enquiries!